We have selected what we have found to be the 3 best dog hair clippers on the market. The dog clippers on our list are all round, versatile clippers that work equally well on a Chow Chow, Poodle or a Golden Retriever as a Pomeranian, Bichon Frisee, Shih Tzu or a Lhasa Apso. In other words, all of our 3 best dog clippers can be used on fine or thick coats as well as long or short hair. 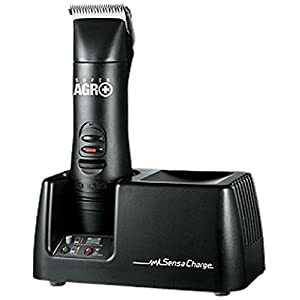 These clippers have multiple speeds and perform smoothly during full body trims and finishing work alike – slower speeds for detail clipping and cooler operation, faster speeds facilitating and speeding up full body clipping. 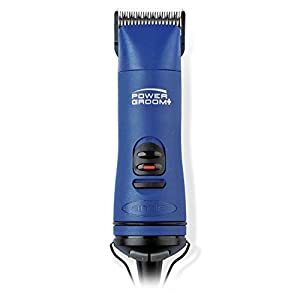 The dog clippers on the list are of reputable brands and should last you for years to come. 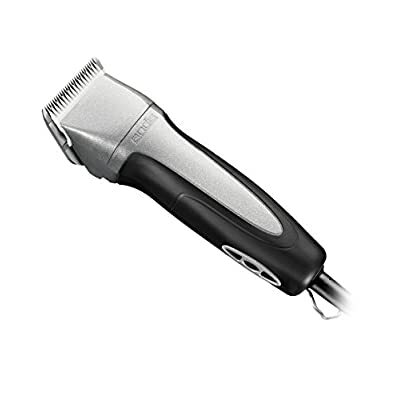 Though sometimes, but not always, more expensive than many other clippers, they are more economical in the long run than other makes that break after a year and/or where spare parts are difficult to get hold of. Review: Acceptable ergonomics, casing drop resistance has been improved, vibrates somewhat, 12 feet power cord. Review: Very good/excellent ergonomics, permanent magnetic motor which generates less heat, casing has excellent drop resistance, low vibration, 14 feet power cord. Review: Excellent ergonomics, permanent magnetic motor generating less heat, casing has excellent drop resistance, 12 foot power cord, low vibration. Review: Very good/excellent ergonomics, permanent magnetic motor generating less heat, casing has excellent drop resistance, 12 foot power cord, low vibration. Review: Acceptable ergonomics, casing drop resistance has been improved, insulated face plate to keep blades cooler, acceptable vibration, 12 foot power cord. Blades: UltraEdge size 10 blade included. Blades:	Ajustable blade; sizes 9, 10, 15, 30 and 40.
Review:Excellent ergonomics, best for feet, face and finish trimming, not intended for heavy duty clipping, 90 min run time, 2,5 hours charging time, NiMH battery, casing has poor drop resistance, low vibration. Blades: Ajustable blade; sizes 9, 10, 15, 30 and 40.
Review: Very good ergonomics, 2 NiMH batteries for continuous run time, 80 min run time per battery, 75 min charging time per battery, poor drop resistance, low vibration. 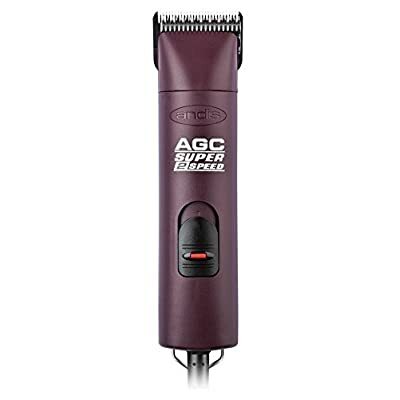 The Andis AGC Super 2-Speed Professional Animal Clippers are super sturdy clippers with a strong, low noise, and low vibration motor that doesn’t easily overheat. The motor is sealed in and needs no cleaning or greasing. 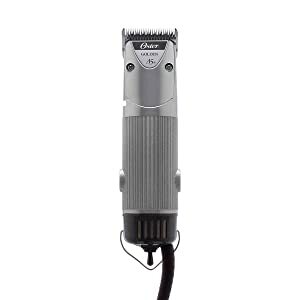 You will find the clipper easy to handle and comfortable to use with the power to deal with the thickest of dog coats. There is a wide choice of blades as the Oster A5 blade range will fit this clipper as well as the Andis blades. We like the extra long 14 feet power cord, the spare blade drive, the low noise level as well as the shatter proof casing. 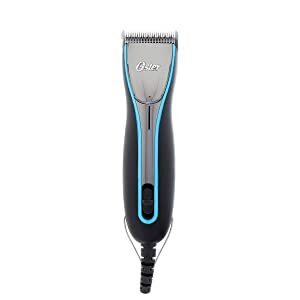 The Oster A6 Heavy Duty Pet Clippers fit wonderfully into your hand and their light weight makes it easy to continue clipping for extended periods of time. If you have small hands this is definitely the best dog clippers for you. These dog clippers have a high efficiency motor that has been insulated to minimize vibrations and noise which is strong enough to cut through dense heavy coats. We like the ergonomic, light-weight, low vibration design, the 3 different speed settings, and the high drop resistance of the casing. 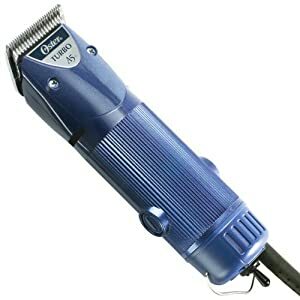 The Andis 5-Speed Excel Dog Clippers are a pair of light-weight, low noise clippers that are very easy to work with. Another advantage with the Andis Excel dog hair clippers is the five different speed settings, ranging from 2500 to 4500 rpm. The dog clippers are slim enough to hold comfortably and to access narrow spaces. The motor is strong, but the casing is somewhat less sturdy than those of the other two clippers. These dog clippers will work with both Oster and Andis blades. We like the light-weight design, the low noise level, the five speed settings and the extra long 14 feet cord. The 3 best dog clippers on our list all come with size 10 blades, but check out the Dog Clipper Blade Guide for Different Dog Breeds below to make sure you get the right blade sizes for the type of coat or breed you intend to clip. Keep in mind that dog clipper blades used on high speeds and/or dense coats are likely heat up sooner or later, so it’s a good idea to have extra sets of blades to allow you to continue clipping while the heated blades cool down. Also, even with the best dog clippers, you will always need to take excellent care of the blades. This is in order to reduce the heating up of the blades, protect the motor, and ensure maximum performance. So, ensure your clipper blades are kept scrupulously clean and oiled. Buying dog hair clippers involves an initial expense that may well seem substantial. In the longer term, however, purchasing a good quality set of dog clippers will turn out much cheaper for you than repeated visits to the groomer. Nevertheless, when choosing your dog hair clippers, you want to make sure you get the best you can for your money. 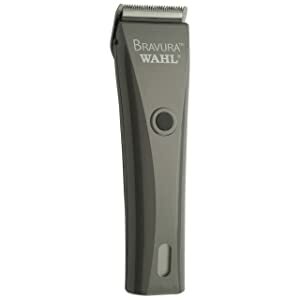 There is a large choice of clippers and at a first glance it’s not easy to make a comparison. To help you, we have put together a guide to the best dog hair clippers and a list of points to consider to help you choose the right clippers for you and your dog. For additional information and reviews, click on the links. First of all, what kind of dog hair clipper you choose obviously depends on your dog. Does he, or she, require frequent grooming? The size of your dog as well as will the thickness of the coat are other factors to take into account. Perhaps your dog is a little nervous and likely to be sensitive to noise or vibrations? And do you plan to just do a bit of trimming or full coat jobs? Secondly, for you to work comfortably with the clipper it should be ergonomic. You want a clipper that is comfortable for you to hold and not be to heavy to work with, especially if you work often and for extended periods of time. The noise level of a dog hair clipper is also important for both you and your pet. Noisy clippers are disturbing and can be frightening for the dog. Overheating is another issue. 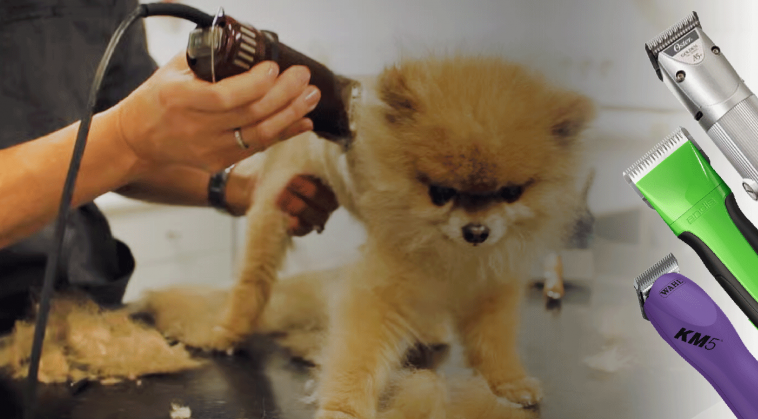 You shouldn’t have to wait to let the clipper cool down when you’re in the middle of grooming your dog. Too much vibration can be tiresome for both dog and groomer. For those who clip frequently, such as professional groomers, vibrations can cause circulation problems in hands and arms. Faster speed usually generates more noise, but it is useful on thick coats and allows for accelerated progress. A multi-speed dog hair clipper is an alternative where versatility is needed. The dog hair clipper’s resistance to knocks and drops is another issue. The clipper should be made of a material that doesn’t break too easily. Is the motor housing sealed or does it have ventilation holes where hair and dust can get in and cause problems? Does the motor have enough power or is it too weak if, for instance, you have a dog with thick matted fur? Do you prefer a corded or cordless dog hair clipper? Some people find it much easier to work with an uncorded clipper, not to mention that you can take it with you and use it anywhere. Yet, with a corded clipper you will never run out of power and won’t have to recharge the clipper. 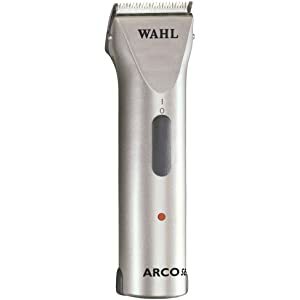 If you opt for a corded clipper you also have a greater choice of good quality clippers. Finally, price is, of course, an important matter. 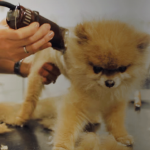 The thing to bear in mind is that a good quality dog clipper that lasts for many years is more cost effective than an initially cheaper clipper that soon breaks and has to be replaced or repaired. A few other things you may want to take into consideration are ease of maintenance, as well as availability and price of spare parts. For additional information about the dog grooming clippers in our guide, as well as photos and reviews, click on the links in the guide. Our Dog Clipper Blade Guide lists blades and dog trimming scissors suitable for different dog breeds. Use the guide as a starting point. As you gain experience and get to know your preferences you can adjust your blade selection accordingly. The Dog Clipper Blade Guide includes 33 different dog breeds. Website addresses to the parent breed clubs, approved by the American Kennel Club, have been included as they often provide useful grooming advice on their sites. If you have a cross breed dog or the breed of your dog is not on the list, the information included might still give you an idea what clipper blades and trimming scissors are suitable for different types of coats and for different trimming tasks. One tip, when it comes to clipping dogs with thick coats and blades heat up easily, make sure you have two sets of blades. That way you can alternate the blades and continue clipping while the heated set of blades cool down. Which Clipper Blades Should I Use? You don’t normally clip the coat short on an Afghan Hound. If you do decide to clip, the desired length of the coat will determine which blade you choose. Dogs with wire haired coats such as the Airedale Terrier are normally hand stripped, or “plucked”, with the aid of a dog stripping knife. This allows the coat to retain its color, structure and water repellant properties. If you use a clipper, clip against the direction of the coat growth where possible. The clipper blade you use depends on the length of coat you want. Bearded Collies are usually not clipped with dog hair clippers, but it you do want to clip your Bearded Collie, the blade used is determined by the desired coat length. Clipping of Bedlington Terriers is usually done with scissors with the exception of the front of the throat area and the chest. The coat of the Bichon Frisee is easily managed by using dog hair clippers. However, trimming for an exhibition should be made by using hand trimming scissors only. If you want to clip your Chow Chow, a tip is to buy two sets of each blade. The density of a Chow Chow’s coat means your dog hair clipper blades will easily heat up, and instead of waiting for the clipper blades to cool down, you simply alternate them. Cocker Spaniels are normally “plucked” or hand stripped with the aid of a dog stripping knife. This allows the coat to retain its color, structure and water repellant properties. If you use a clipper, clip against the direction of the coat growth where possible. Front and feathering should always be trimmed with dog trimming scissors. Dandie Dinmont Terriers and other dogs with wire haired coats are usually stripped, or “plucked”, by hand with the aid of a dog stripping knife. This allows the coat to retain its color, structure and water repellant properties. If you use a clipper, clip against the direction of the coat growth where possible. The clipper blade you use depends on the length of coat desired. English Setters are normally hand stripped, or “plucked”, with the aid of a dog stripping knife. This allows the coat to retain its color, structure and water repellant properties. Front and feathering is always trimmed with dog trimming scissors. Gordon Setters are normally hand stripped, or “plucked”, with the aid of a dog stripping knife. This allows the coat to retain its color, structure and water repellant properties. Front and feathering should always be trimmed with trimming scissors. Irish Setters are normally hand stripped, or “plucked”, with the aid of a dog stripping knife. This allows the coat to retain its color, structure and water repellant properties. Wire coated terriers, including the Irish Terrier, are normally hand stripped, or “plucked”, with the aid of a dog stripping knife. This is to permit the coat to retain its color, structure and water repellant properties. If you use dog hair clippers, clip against the direction of the coat growth where possible. The clipper blade you use depends on the length of coat you want. The Kerry Blue Terrier is normally clipped with trimming scissors. Some areas, however can be trimmed with dog clippers. Lakeland Terriers, like other wire coated terriers, are normally hand stripped, or “plucked”, with the aid of a dog stripping knife. This allows the coat to retain its color, structure and water repellant properties. If you use a clipper, clip against the direction of the coat growth where possible. Choose clipper blade according to the desired coat length. Use dog hair clippers only on the hind legs, nose and two thirds of the tail. The Schnauzer is often “plucked” with the aid of a dog stripping knife in order to maintain the color, structure and water repellant properties of the coat. However, using a dog hair clipper is also common practice. Scottish Terriers, along with other wire coated terriers are usually hand stripped with the aid of a dog stripping knife. This allows the coat to retain its color, structure and water repellant properties. If you use a clipper, try to clip against the direction of the coat’s growth where possible. The clipper blade you use depends on the length of coat you want. The Soft Coated Wheten Terrier can be clipped with dog hair clippers, but apart from the ears, it is often trimmed with scissors. The Springer Spaniel are normally hand stripped, or “plucked”, with the aid of a dog stripping knife. This allows the coat to retain its color, structure and water repellant properties. Front and feathering are trimmed with trimming scissors. If you use a clipper, clip against the direction of the coat’s growth where possible. As with other wire coated terriers, the Welsh Terrier is normally hand stripped, or “plucked”, with the aid of a dog stripping knife. This allows the coat to retain its color, structure and water repellant properties. The wire coated West Highland White Terrier, is usually hand stripped or “plucked”, with the aid of a dog stripping knife. This allows the coat to retain its color, structure and water repellant properties. Therefor, if you use a clipper, clip against the direction of the coat growth where possible. The clipper blade you use depends on the length of coat you want. Terriers with wire haired coats, like the Fox Terrier, are normally hand stripped, or “plucked”, with the aid of a dog stripping knife. This allows the coat to retain its color, structure and water repellant properties. If you use a clipper, clipt against the direction of the coat growth where possible. The clipper blade you use depends on the length of coat you want. Yorkshire Terriers are generally hand stripped, or “plucked”, with the aid of a dog stripping knife. This allows the coat to retain its color, structure and water repellant properties. For this reason, if you use a clipper, clip against the direction of the coat growth where possible. The clipper blade you use depends on the length of coat you want.